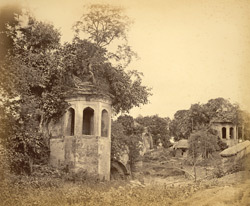 Photograph of the ruined bridge at Paglarpul taken in the 1870s by an unknown photographer. This famous bridge was built in the 17th century when Dhaka was a seat of Mughal Government. The area has a hot, damp tropical climate and is flooded periodically by waters from the Bay of Bengal as well as from the yearly moonsoon. By the 19th century many of the once-elegant buildings in the city were ruined by the action of both the climate and the resultant wildly luxuriant overgrowth of trees and vegetation which lent them a picturesque look and made them popular subjects for artists and photographers.